Kabré is a word from Ngäbe Language which means a bunch. This fits the current cluster composition, which features multiple parallel architectures. Through this tutorial you will learn how Kabré is composed, how to connect to the cluster, submit jobs, retrieve results and about environment modules. To complete this tutorial you will require a ssh client. In Unix and Linux platforms, there is commonly a terminal emulator capable of establishing ssh sessions. In Windows plataforms you should download a ssh client programm, like Putty or simmilar. Also, you will requiere an active account in Kabré and valid credentials. If you don’t have one, please contact us at cnca@cenat.ac.cr, explaining your situation. Before proceding, this is a good moment to test your credentials. Open your terminal emulator program and type the following, changing user_name for your Kabre user name. If you are in a *nix environment, you can simply execute the cell, a dialog box will open, requesting your password, if everything is OK, the number in the left (the one around [ ]) should increase in one and a message in red should appear, telling "Pseudo-terminal will not be allocated because stdin is not a terminal." Sections ahead, we will explain how to setup ssh keys to avoid typing your password everytime you log into Kabré. The following image shows a network diagram of Kabré. We will discuss about the mayor components in the diagram. This is a very special node, it supports many services of the cluster. Its existence should be transparent for all users. If, for some reason, you find yourself in Meta-node, please leave and inform that situation, it could mean a problem. Running programs in Meta-node is considered bad behavior. Running parallel code or heavy tasks on login nodes is considered bad behavior. They are a general parallel programming platform, that means, they will fit many applicacions. Every node has 2 Intel Xeon processor, with 4 cores @ 2.4 GHz and 32 GB. Cadejos-0, cadejos-1 and cadejos-2 feature 2 Nvidia Tesla C1060 GPUs each one. Each of these 4 nodes feature a Nvidia Tesla K40 GPU. The host has an Intel Xeon with 4 cores @ 3.2 GHz without hyperthreading and 16 GB, therefore, only applications with an intensive use of GPUs would get a relevant speed-up. The war horse of Kabré. 20 Intel Xeon Phi KNL nodes, each one with 64 cores @ 1.3 GHz and 96 GB; each core has two AVX units. If your application can be splitted in many smalls pieces and use vectorization, this architecture can provide impressive speed ups. Node nomenclature reflects the fact that nodes are distributed in 5 blades, going from 0 to 4 and nodes a to d, for example: zarate-0c means node c in blade 0, zarate-3a means node a in blade 3. In this section we will cover ssh connections, ssh keys, and how to copy files. Remember to change user with your user name. Type your password when prompted. You will be logged to some login node. This is a typical linux terminal, so, try out some known commands, like ls, cd, mkdir and so on. Alternatively, you may execute this procedure in a single command if it is available in your working station. Now, if you open a new terminal and type ssh your_user@cluster.cenat.ac.cr you will be logged without prompting for the password. This is because Kabré has the public key of your computer. It is also convenient for your computer to have the public key of Kabré, simply append it to autorized_keys in your local computer. Login nodes are suitable for light task, as mentioned before: editing files, compiling, copying files, and similars. 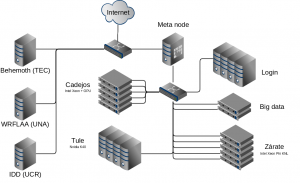 Heavy tasks are expected to run on Cadejos, Zarate or Tule nodes. To enforce a fair sharing of resources among users, your task should be submitted to a queues system. It is like forming up at the bank, once your task makes its way to the head of the line, it will be granted all requested resources an will run until completition or until it consumes its time slot. The process of submitting a job in Kabré could be divided in four steps: writting a PBS file, queueing your job, monitoring jobs and retrieving results. This configuration file tells the queue system all it needs to know about your job, so it can be placed in the right queue and executed. Lets try it out with a minimun working example. Below is a C code that approximates the value of pi using a Montecarlo method. Log into Kabré, copy the text to a file and save it with name pi_threads.c . And that’s all! Your job will be queued and executed, in this case, on a Xeon Phi node. A pasive way of monitoring your jobs is to indicate PBS to send an email when done. This can be configured in the PBS file using the -m option, as shown below. b means begin, e means end and a means abort. This will execute qstat command every 5 seconds. Your job will appear with the name specified in the PBS file. This method requires to keep open a ssh session in Kabré. If you want to check your job’s progress with your cellphone or other device without opening an ssh connection, CeNAT has a webpage that runs qstat command every 5 seconds and shows its output. Just go to cluster.cenat.ac.cr/torquitor. You can copy those files to your local computer o run another script for post-processing the output. Behind scenes, module command is just configuring paths, aliases and other environment variables, so, modules are loaded only for the current shell session. You can request specific modules in you jobs, just add “module load module_name” lines to PBS file body, below all #PBS lines and before runing your program.